The largest land trust in Ohio, the Western Reserve Land Conservancy works to protect natural areas and farmland primarily through conservation easements that ensure permanent preservation. It was created 10 years ago when eight northern Ohio land trusts merged to form a region that stretches from Sandusky Bay to the Pennsylvania border and from Lake Erie to Wayne County. It grew again four years later when it merged with Grand River Partners, and was joined by the Waite Hill Land Conservancy and the Little Beaver Creek Land foundation in early 2013. Today, the organization covers 17 counties. The eight local land trusts that initially formed the Land Conservancy in 2006 had collectively preserved about 8,000 acres over 20 years. Since the merger, however, they have preserved close to 50,000 acres including creating 140 public parks and preserves with their partners. They have also raised approximately $450 million on behalf of them. The organization boasts a diverse portfolio. 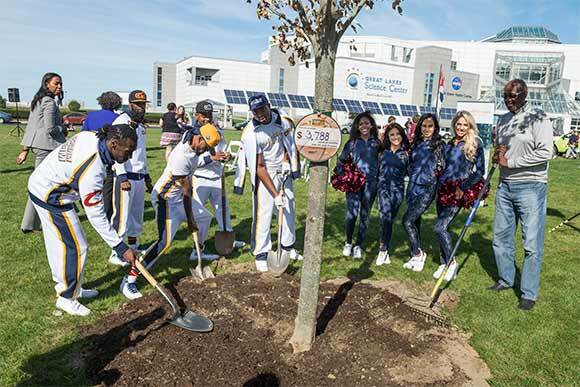 It even celebrated the Cleveland Cavaliers winning season by launching an effort to plant 433 trees (the number of three-pointers made by the team at home) in partnership with the Cleveland Cavaliers and several other organizations via the Trees for Threes effort. Such reforestation programs are critical to the group's ongoing Reforest Our City project, which aims to restore the city’s tree canopy closer to its ideal 40 percent. (It currently resides at 18 percent with some urban areas as low as nine percent.) Cleveland loses 97 acres of tree canopy every year. Another project that is much to the delight of locals, is the acquisition of the Modroo Farm in Russell Township for $1.6 million. An event 20 years in the making, the plan is to convert the farm into a public park with a new trail, reforestation and restoration. The property will be owned by the Russell Township Park District. However, he adds there is a gap between how the public perceives the organization and what they actually do. The organization closes 50 to 60 projects and preserves approximately 4,000 to 5,000 acres annually. A perfect example of the Land Conservancy's work is unfurling at the former Henninger Landfill site just east of the Metroparks Zoo from Pearl Road to Valley Road in Old Brooklyn. It is a project that has been in the works for more than 10 years. The topic of re-purposing the land has been on the lips of many Old Brooklyn officials over the years since the landfill closed in the 1950s. Last year, the nonprofit was finally able to take possession of the site after securing a Clean Ohio Green Space Conservation Fund grant to acquire it and adjacent properties along Big Creek, totaling approximately 25 acres or 1,015 linear feet of the waterway. The group secured another grant to cover the remediation of part of the property, which Land Conservancy project manager Jeffery Schiffman describes as one to two acres. “They will probably remove about two feet of bad soil and replace it with about four feet of clean soil,” he explains, adding that the exact size and shape have yet to be determined. Schiffman says that portion of the project should begin within the next 30 days and is expected to take three to six months, depending on the weather. After that, the group will participate in park planning and opening the space to the public. Eventually it will tie into the Ohio & Erie Canal Towpath Trail. He expects to begin fund-raising in the early part of 2017 with construction starting later that year. Verespej says it will be a passive park with a multipurpose trail for hiking and cycling and great views of the rivershed. “You’re going to see wildlife back - and the space will provide a welcomed calm respite from the rest of life. The Land Conservancy has obtained a conservation easement on the property restricting any future development. They expect this to also improve the water quality of Big Creek, a Cuyahoga river tributary. It is part of the Cuyahoga River Watershed, which drains 812 square miles through six counties, much of which is designated an area of concern for pollution. Another of the Land Conservancy’s ongoing programs involves massive urban revitalization. Jim Rokakis knows a thing or two about serving the community after acting as a member of Cleveland City Council for 19 years and working for the county treasury for 14 years. He’s been involved with dealing with the fallout from the financial crisis since 2000 when he attempted to meet with members of the federal government about predatory lending in Ohio. Alcoa and Western Reserve Land Conservancy volunteers plant trees at the Henninger Landfill siteRokakis and the Land Conservancy both lobbied for the Ohio land bank bill, which passed in December of 2008. Land banks (technically called county land reutilization corporations) give county officials the opportunity to quickly acquire distressed properties that would otherwise attract crime and lower property values so they can be put to better use. In March 2011, the Land Conservancy launched a statewide effort called Thriving Communities to help revitalize urban centers plagued with an overabundance of vacant homes. They named Rokakis as its director, asking him to help establish an urban arm of the organization and set up what now numbers 40 land banks, including one in each of the conservancy’s counties except Medina and Geauga. Thriving Communities has grown to include conducting geographic information system (GIS) property surveys to assist with planning decisions, reforestation, securing funding for demolition, and general greening. Rokakis says there are an estimated 100,000 vacant properties in Ohio. After lobbying the Ohio attorney general for money from the state's $93 million robo-signing settlement, the organization secured $75 million for the demolition of vacant properties and raised an additional $47 million for that purpose. The Land Conservancy removed 14,600 vacant properties by the closing of that program in 2014. “In all these distressed communities people talk about wanting to make them better, but they never talk about removing the blight,” he notes. Rokakis then went to the United States Treasury to state the case for the problem's national impact. After providing a study proving the likelihood of foreclosures is stronger where vacant properties are not removed and less likely where they are removed, Thriving Communities secured $80 million from the Hardest Hit Fund. Through another opportunity, the organization was able to have an additional $2 billion reallocated to the Hardest Hit Fund ($192 million of which was then allocated to removed blighted properties). Rokakis adds some neighborhoods were so distressed that a study in 2013 showed no value was added when blight was removed. However this had changed. A June 2016 Dynamo Metrics study for the Ohio Housing Finance Agency now shows an increase in housing values where blight is removed. Tree Steward Training at Saint Luke's The organization also works with property owners to permanently preserve valuable natural areas in our urban environments and with cities, suburbs, and park systems to create trails, greenways, and parks that serve people in more densely populated areas. 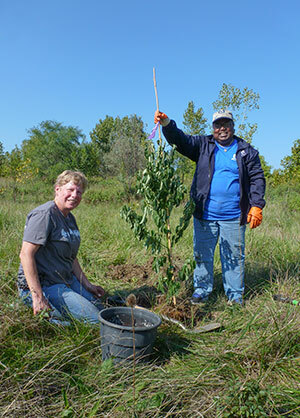 As part of its green efforts, the Land Conservancy works with nonprofits, municipal officials, community development corporations, and residents to restore Cleveland’s depleted tree canopy, including extensive Tree Steward Training – which is part of the Reforest our City campaign – for residents as well as a grant program for groups looking to plant trees in their neighborhood. 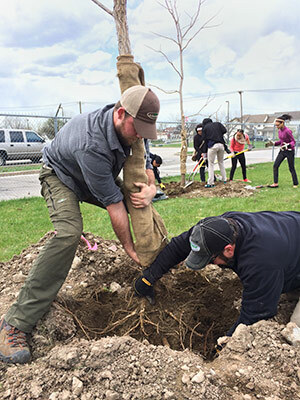 The organization is responsible for thousands of trees planted within the last three years. “We should start using vacant land to restore the depleted tree canopy in greater Cleveland,” Rokakis says. “We have to remove the blight then re-purpose the vacant land with greening. Staff studies have prompted policy changes at the federal, state and local levels, and the Vacant and Abandoned Properties Action Council (VAPAC) – the only collaborative effort of its type in the country – is based at the Thriving Communities Institute. "We see an opportunity to step in, and we know where the money is,” Rokakis says of the organization's effectiveness. Demonstrably, those efforts have recently resulted in the preservation of 50 acres of woods in Bedford Heights and Maple Heights, but by no means does that give the group reason to rest on its laurels. 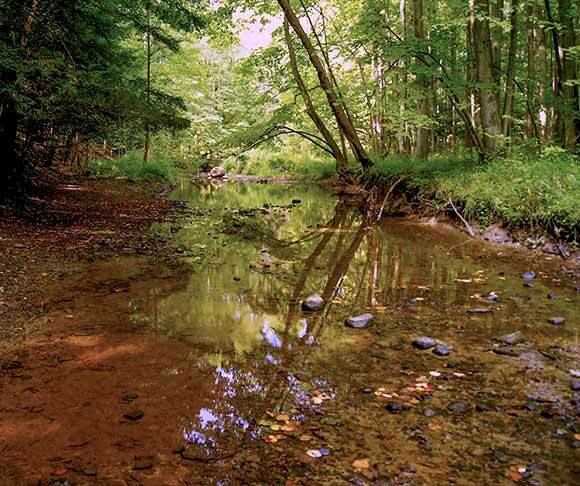 This story was made possibly through a partnership with Western Reserve Land Conservancy, which is part of Fresh Water's underwriting support network.